James Tyldesley 1719-1765, grandson of Thomas Tyldesley 1657-1715, the Diarist, married Sarah Hayne on 11 December 1739. 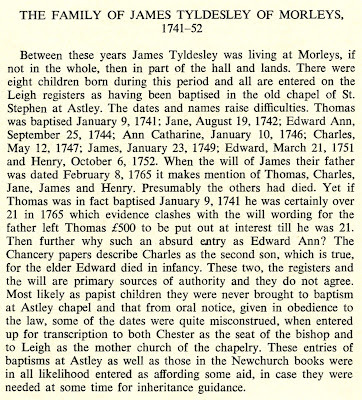 Between these years James Tyldesley was living at Morleys, if not in the whole, then in part of the hall and lands. There were eight children born during this period and all are entered on the Leigh registers as having been baptised in the old chapel of St. Stephen at Astley. The dates and names raise difficulties. Thomas was baptised January 9, 1741; Jane, August 19, 1742; Edward Ann, September 25, 1744; Ann Catharine, January 10, 1746; Charles, May 12, 1747; James, January 23, 1749; Edward, March 21, 1751 and Henry, October 6, 1752. When the will of James their father was dated February 8, 1765 it makes mention of Thomas, Charles, Jane, James and Henry. Presumably the others had died. Yet if Thomas was in fact baptised January 9, 1741 he was certainly over 21 in 1765 which evidence clashes with the will wording for the father left Thomas £500 to be put out at interest till he was 21. Then further why such an absurd entry as Edward Ann? The Chancery papers describe Charles as the second son, which is true, for the elder Edward died in infancy. These two, the registers and the will are primary sources of authority and they do not agree. 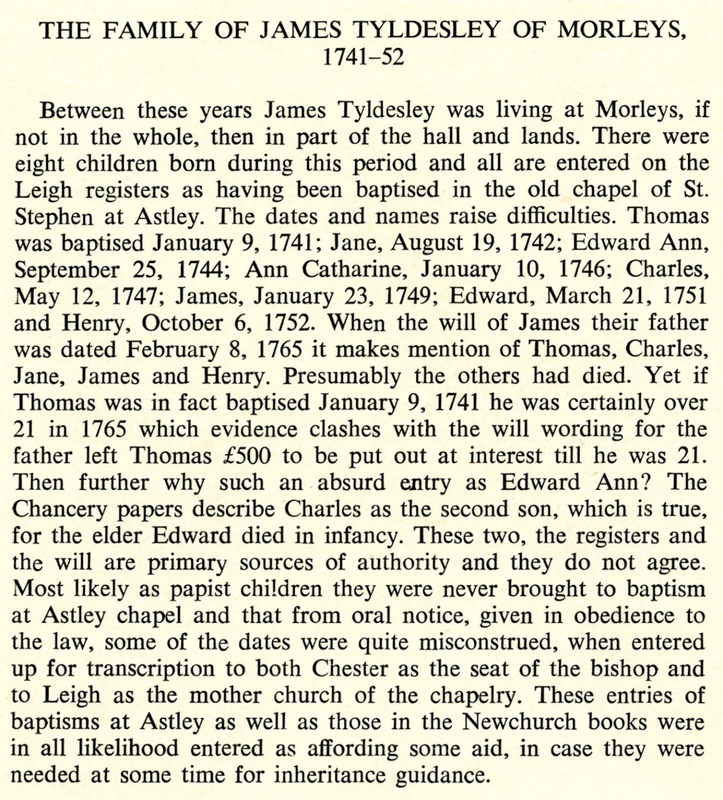 Most likely as papist children they were never brought to baptism at Astley chapel and that from oral notice, given in obedience to the law, some of the dates were quite misconstrued, when entered up for transcription to both Chester as the seat of the bishop and to Leigh as the mother church of the chapelry. These entries of baptisms at Astley as well as those in the Newchurch books were in all likelihood entered as affording some aid, in case they were needed at some time for inheritance guidance.